Life's better at the tiny table. I love getting things in the mail. While online shopping is fun, receiving packages from friends is much more exciting. While perusing a selection of food blogs, I found The Lean Green Bean. Lindsay created the Foodie Pen Pals in which participants send boxes full of goodies to each other once a month. It seemed like a neat way to connect with other bloggers and try out their favorite foods and treats. The Foodie Penpals have a few rules including deadlines for contacting your pen pal, sending your treat box and posting your reveal blog. The rules make sense and are easy to follow. Another part of the program is while you send your pen pal something, someone else has your name so you connect with TWO people each month you participate. My October box came care of Seth. He doesn’t have a blog but he does have a Twitter account and his photos of his culinary adventures around Chicago can be found @ChiCityFoodie. Give him a follow! 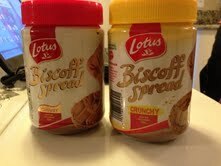 Seth sent me 2 jars of Biscoff spread. Biscoff cookies are THE airline cookie. I had never heard of it being used to create a spread before and can’t wait to try it out on my English Muffins! If you’re interested to see who my pen pal was, you can check out Shaunna’s blog Tempting Thyme! All in all, I think it’s a great program. I’ll be participating again in November! Thanks again Tamre! Used the Taco seasoning last night for impromptu walking tacos. Yummy! Hi, I'm Tamre. I'm a food obsessed Midwesterner. I love to host parties big and small. Life's better at The Tiny Table.